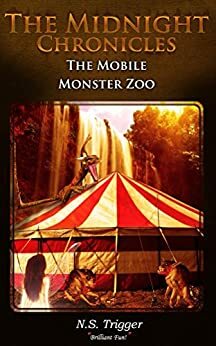 When a Mobile Monster Zoo comes to town posing as a themed circus, Bethany Rider and her friends soon work out that something more sinister is afoot. Bethany, Derek, Caitlin and Jake all return in this spellbinding sequel to find the stolen Obsidian Orb - the source of all of Strataton’s power. This time, however, they’re not allowed to use magic! Is midnight behind the theft, and why is Bethany still having dreams about a witch that was vanquished months ago? Neil Trigger was told at school that much of what came out of his mouth was unrealistic and random, so he found a career where these traits could be used as a positive. After leaving his secondary school to join an art college in the hope that he would one day become an animator, Neil was disappointed when the promises of doing animation proved to be totally false. Instead, he spent every spare moment in the library, avoiding moronic classmates and honing the part of his course he liked – creative writing. He also spent hours learning the art of website design – then an emerging technology that he had to teach himself because even the lecturers were just beginning to pick it up. When Neil left in 1998, he started his own website design company and went to University the following year where he studied IT and English Literature. “I was far too into beer and girls to concentrate on my University work, to be honest” Neil admits. Unperturbed, Neil set about an eclectic mix of jobs from working in McDonalds, selling insurance and even becoming a professional magician! In 2004, after being laid off during paternity leave (which he still thinks is morally questionable), he took a decision that would change his life. He swung the car around (literally) and went back to University to apply for a different course. With extra years of life experience, he completed three years in IT and Media (which better suited his desire to write, but without such stringent reading timetable) and achieved a first class degree. He then went on to study for a PhD in psycho-linguistics (which is a bit like working out how people read and then establishing the best way to write, so that you can communicate with them more accurately). He launched his writing career rather late when his daughter asked for a story. With no room on the bookshelf to buy another book (she had read all of the books), he decided to write a new story on his iPhone (stealing a few minutes at a time, while sat on the toilet). Eventually his iPhone became too cumbersome to handle the quantity of text and so he uploaded it to his blog. The files were soon read by others who commented and asked for a copy in print. This book became The Weird Case of Mrs Etherington-Strange; the first in The Midnight Chronicles series. Neil now lives in Bristol and enjoys writing, painting and technological stuff.